We use to have a very small kitchen with not much of a pantry. That didn’t keep me from wanting a bigger one and planning for the day of a bigger kitchen with an amazing pantry. Now I have a bigger kitchen and more of a pantry which is awesome. So I found these 16 amazing pantries that will give you some ideas for your own pantry no matter the size. I also wanted to find simple pantry organization ideas because the more simple and easy it is the more likely it is I will do it. 1. 10 Tips for an Organized Pantry-Everyday Enchanting shows how she organized her pantry from top to bottom. 2. Classy Clutter’s pantry makeover– I love all the cute jars, especially the sprinkles. 3. Can food pantry storage-great idea for when you have a lot of canned foods. 4. Adorable Pantry Makeover– I love the matching baskets that she used in her pantry makeover. 5. Pantry pull out drawers– What a great way to maximize space. 6. Dollar Store Pantry Makeover– I love this beautiful pantry and love that it was so inexpensive. 7. How to Organize your Pantry– I love her simple pantry organization ideas, part of a whole series on organization. 8. A Clean Pantry is a Happy Pantry-How to keep your pantry clean so you know what you have. 9. 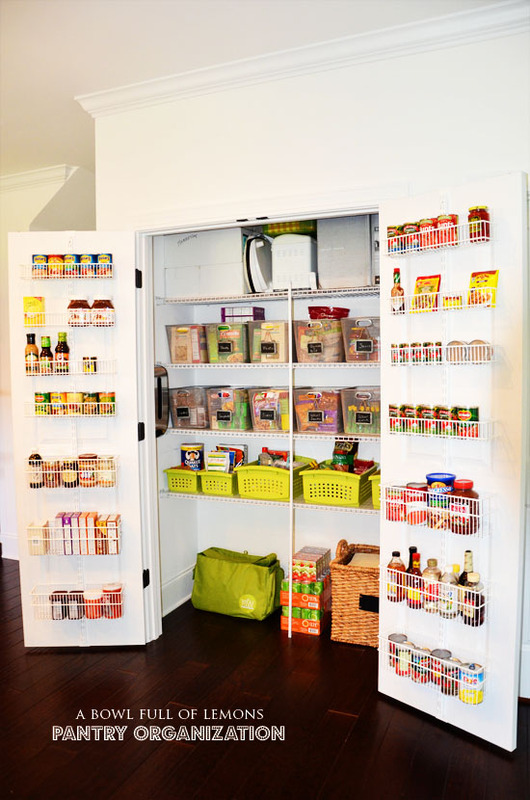 Another great Pantry Makeover– Love the use of baskets and the can stacker. 10. An Inspired Pantry– Great and interesting use of space. 11. Awesome Pantry Project-Amazing before and after. So gorgeous. 12. Interior and Exterior Pantry Makeover– I love the pattern she used in her pantry. 15. Pantry redo Reveal-great use of a corner pantry, love the apron hooks. 16. Beautiful Kitchen Pantry Makeover– Another amazing pantry. Great list! I love finding new ways to update my pantry and re-organize! oh man. Definitely going to be taking a look at a few of these posts for some kitchen cabinet organization. We don’t have a pantry, but more of a huge kitchen where we don’t even utilize half the cupboard space. My sister was actually just talking about this same exact topic! I will be sending this to her. You are speaking my language, I love organizing! You are welcome, glad you like them! This is SO perfect! My tiny apartment has an even tinier kitchen! I basically just throw everything in the two cabinets I can reach and ignore it. But this fall my goal is to get organized! A good range of articles and a good read. I love the top right one in the picture! I painted the inside of our pantry doors with chalkboard paint and we absolutely love using it for lists and such. I love when you posts all these great ideas and link them to other bloggers! It seriously makes my day plus I love ORGANIZING! My pantry needs some serious reorganisation. Thanks for the ideas. I’m in the same boat as you, just have a cupboard for our ‘pantry items and I cannot wait to get an actual-for-real pantry. And trust me, when I do – it’s going to be awesomely organized. Sigh. thanks for the list!!! OOh I need to put these strategies to good use! My pantry looks terrible! kendall recently posted…Best dishwasher detergent & storage! 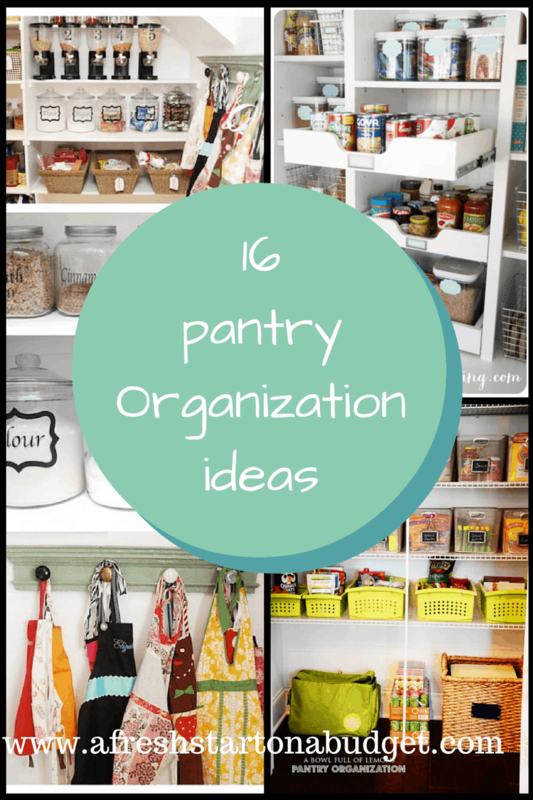 I definitely need to go and read all of these pantry organization ideas. The pantry gets so disorganized so quickly! My pantry is always a mess. Great resource. Amazing ideas. I am all about a organized pantry. I am way to OCD for it to be messy. Great tips! Great ideas! Makes me wish we had a real pantry – we just have cupboards in our kitchen. Thanks for posting all of these ideas. I have a small kitchen too. Christen recently posted…Work at Home Job Weekly Round Up! We have a small pantry too, I feel your pain. These are all great tips, I’m going to go read a few of them! this is exactly what I needed, thanks for sharing it! These are such great ideas! I have a ton of organizing to do this week so thanks for the inspiration! Love this! My pantries are an absolute mess. I hate having small storage space in the kitchen! It is very common in apartment life though, I can’t wait to get a bigger place and use some of these!! What a great list! Thank you! These are great inspiration! We are currently remodeling our kitchen and the number one thing I had to have was pull out shelves for our pantry. I don’t have a pantry currently and I dream of having a large one so I love looking at organized pantry pics!